When Revealed: Until the end of the phase, raise the total Threat in the staging area by X, where X is the number of players in the game. Shadow: Defending player raises his threat by the number of enemies with which he is engaged. 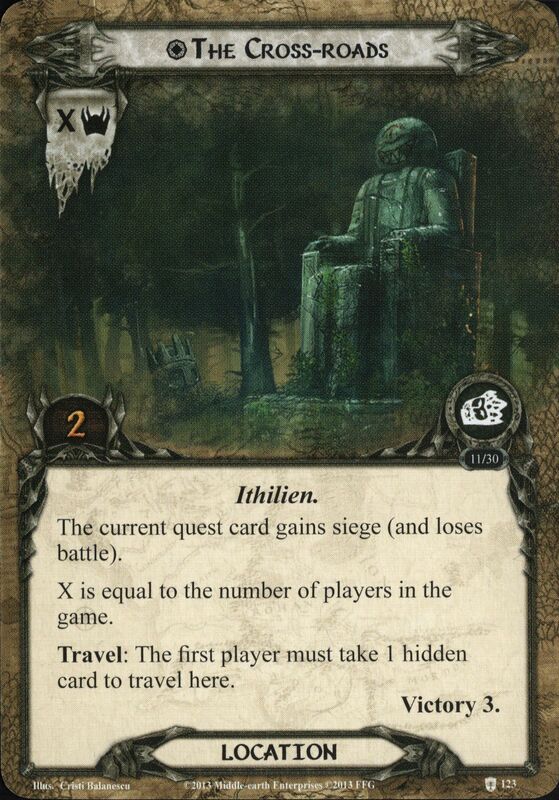 When Revealed: Reveal X additional cards from the encounter deck and add them to the staging area. X is the number of players in the game. 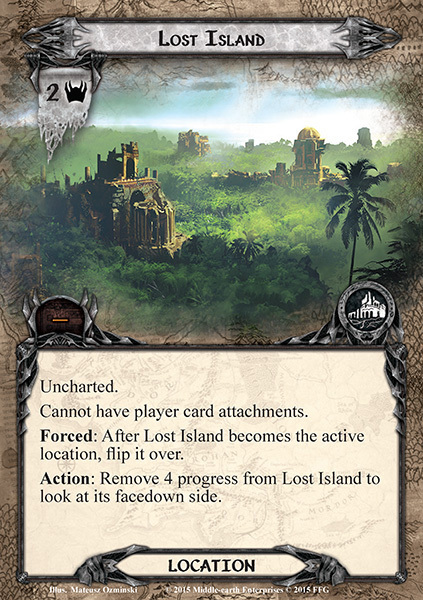 Forced: After an enemy is defeated, place 1 resource token here. Then, if there are at least X resource tokens here, flip Hunting the Orcs and place each resource token that was on it on Savage Counter-attack. X is 3 more than the number of players in the game. 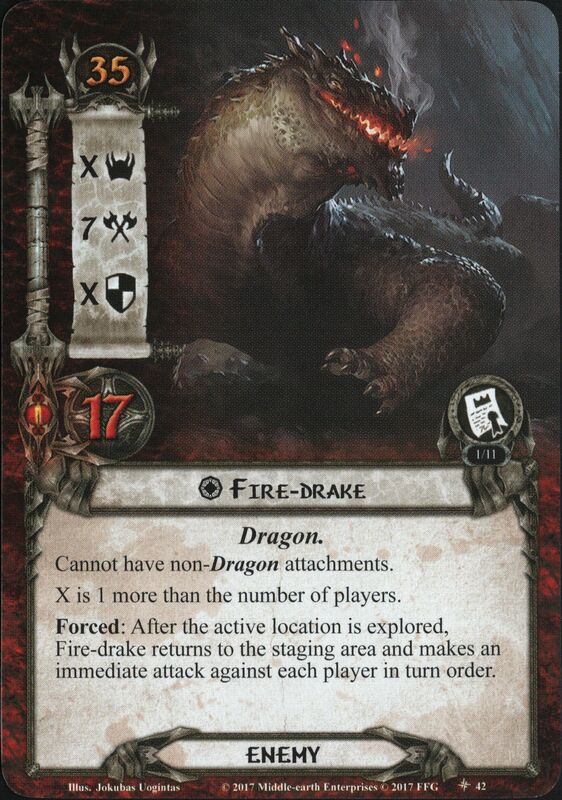 Forced: When a card is placed underneath The Havens Burn, reveal the top card of the encounter deck. 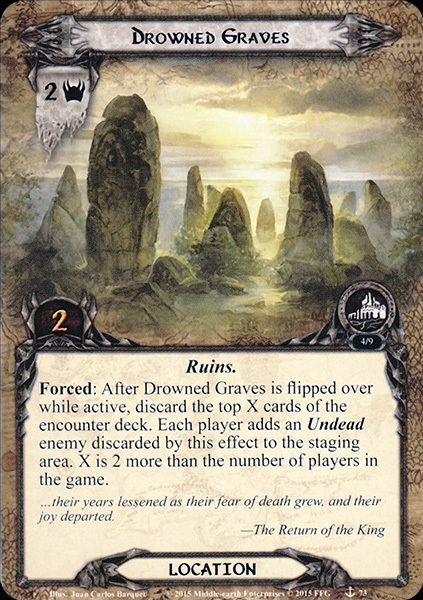 If there are X or more cards underneath The Havens Burn, the Corsairs have destroyed the Elven fleet and the players lose the game. X is 3 more than the number of players in the game. X is the number of players in the game. Immune to player card effects. Cannot be optionally engaged. Temple Guardian gets -50 engagement cost while Cursed Temple is the active location. X is the number of players in the game. When Revealed: Assign X damage among characters you control. X is the number of players in the game. While Plain of Isengard is in the staging area, archery damage must be assigned to allies, if able. Wizardry: Each player discards 1 ally he controls. When Revealed: Assign X damage among characters committed to the quest. X is one more than the number of players in the game. Shadow: Attacking enemy gets +1 Attack (+2 Attack instead if the defending player has 1 or fewer cards in his hand). Immune to player card effects. X is twice the number of players in the game. 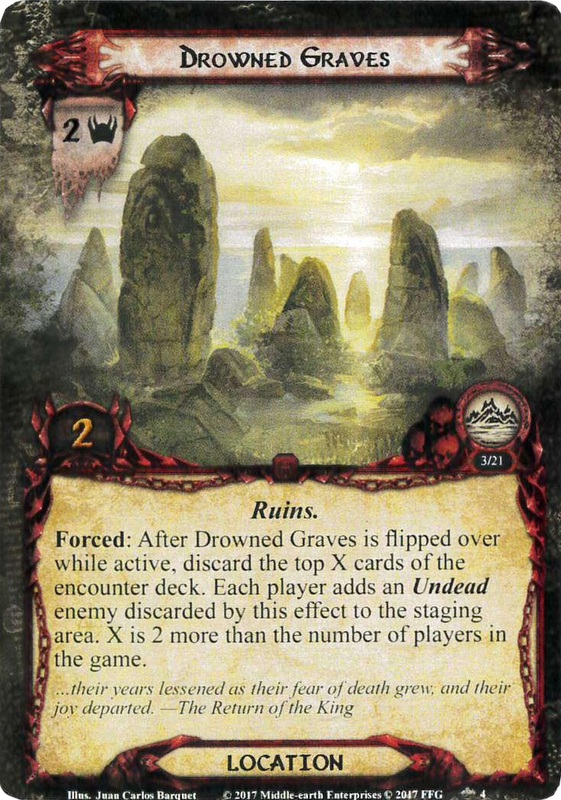 Forced: When Army of the Dead attacks, you must either attach a set aside Overcome by Fear to your threat dial, or discard an ally you control. While Abandoned Mine is in the staging area, progress cannot be placed on locations in the staging area not named Abandoned Mine. 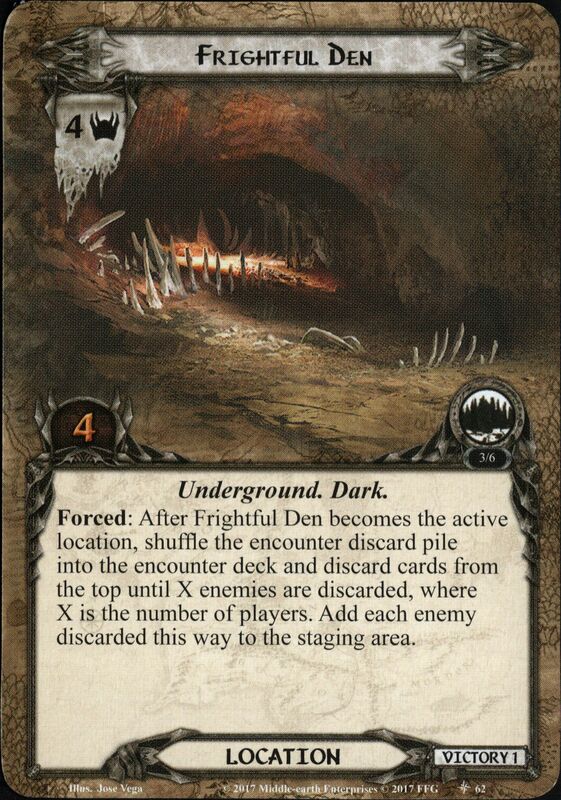 Forced: When resolving the Discover keyword on Abandoned Mine, look at X additional cards where X is the number of players in the game. 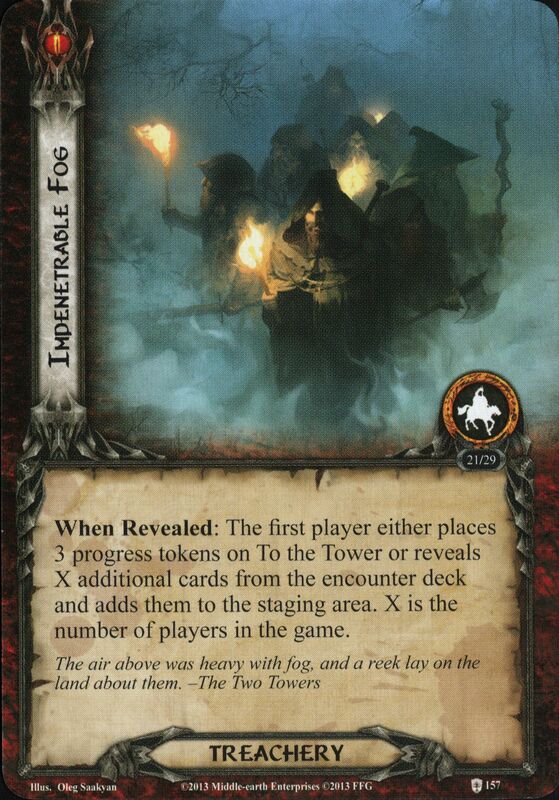 When Revealed: Reveal the top X cards of the encounter deck, adding all enemies to the staging area. Discard the other revealed cards without resolving them. X is 2 plus the number of players not engaged with a Goblin enemy. When Revealed: Shuffle X Tentacle enemies from the encounter discard pile into the encounter deck. Heal X damage from The Watcher, if it is in play. X is the number of players in the game. Cannot have attachments. Archery X. X is the number of players in the game. Mûmak Elite cannot take more than 3 damage each round.